Bargello are quilting patterns made up of strips of fabric. These strips of fabric are pieced together to create a sense of movement in the design. This technique translates well into paper-crafting. It’s a great way to use up paper scraps! My October Fresh Card Making Tutorial will feature the Bargello Faux Quilting Technique. The tutorial will hit e mail inboxes at 9:00 am (MST) on October 23, 2018. Please add your name to my mailing list by 8:00 am (MST) on October 23 to receive this tutorial, complete with step-by-step instructions with color photos in a pdf format. Here's another quick and easy card created using the new Petal Passion Designer Series Paper from Stampin' Up! This DSP is found in the 2018 Occasions Catalog. The designs are in black and white. I really like the simplicity of the black and white images. But, in this case, I decided to add a little color to the design by using my watercolor pencils. I think it's a nice touch, don't you? Cut a partial circle out of one of the Petal Passion designs using the Big Shot and Circles Framelits Dies. A circle punch will work too. Attach partial circle to Whisper White card front. Stamp greeting from Eastern Beauty stamp set using Archival Black ink. Color flowers in using watercolor pencils. Stampin' Write markers would work too. 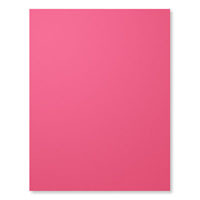 Card measures: 3 3/4" x 3 1/2"
Have you checked out the new collection of Designer Series Paper found in Stampin' Up! 's Occasions Catalog? I love the simplicity of the black and white images. Here's a clean and simple card I created using one of the designs in the paper stack. I let the designer series paper do most of the work with this quick and easy card. 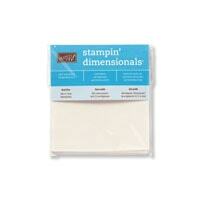 Card measures: 3" x 3 1/2"
Be sure to check out the full line of designer series paper from Stampin' Up! And remember, it's Sale-A-Bration time. For every $50 purchased, you'll earn an exclusive free item out of the Sale-A-Bration Catalog. 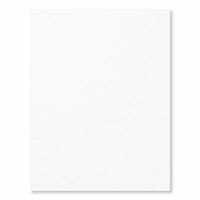 Sympathy cards can often seem like one of the most difficult types of cards to create. I mulled it over for awhile, and then decided to get out my pack of Delightful Daisy Designer Series paper. One of the selections in the pack is the pretty daisy design. Perfect, I thought. I'll just let the designer series paper to most of the work to create a quick and easy, yet pretty and appropriate for the occasion card. I started with a regular 5 1/2" x 4 1/4" Whisper White card base. I trimmed the card so I'd have a 3 1/4" panel on the front. I cut the daisy patterned paper 3" by 5 1/4". I stamped the greeting from Thoughtful Branches (retired) toward the bottom of the paper using Early Espresso ink, then attached it to the front panel. I cut another patterned piece from the designer paper collection 1" by 5 1/4" and attached it to the inside of the card to complete. I really like how the patterns compliment each other. I also like how easy this card came together. Be sure to check out the Stampin' Up! collection of designer series paper. Let the paper do the heavy lifting for you! I was cleaning up my crafting table and found a piece of Whole Lot of Lovely Designer Series Paper (from this project posted HERE) and a bee that had been stamped with Dragonfly Dreams and cut out using the Big Shot and the coordinating Detailed Dragonfly Thinlits dies. Ah, time for a quick and easy 5 minute creation! All I had to do was stamp and punch out the daisy, and add a greeting. Stamp daisy image from Daisy Delight twice on a piece of Crushed Curry card stock using Black Archival ink. Punch daisies out using the coordinating Daisy Punch. Layer one on top of the other using a Dimensional. Stamp 2-step bee from Dragonfly Dreams onto a piece of Whisper White card stock using Crushed Curry and Black Archival ink. Cut out using the Big Shot and coordinating Detailed Dragonfly Thinlits Die. Mat piece of Whole Lot of Lovely Designer Series Paper using Basic Black card stock. 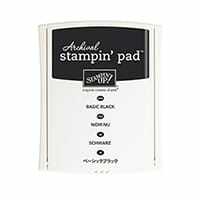 Stamp greeting from Daisy Delight onto Crushed Curry card base using Black Archival ink. Attach layered Designer Series Paper. Attach daisy and bee using Dimensionals. I added a large rhinestone from my stash that I colored in with a black Sharpie Pen and attached it to them middle of the daisy to complete the card. So next time you are clearing up your crafting space, keep an eye out for bits and pieces used for other projects. These pieces can then be used to create another project quickly. If you like this idea, please be sure to sign up for my mailing list. I send out exclusive stamping ideas at least 3 times per month. To sign up, please us the sign up box located on the upper right hand corner of this page. As a thank you, I will send you a free Adhesives 101 Tutorial! This is a quick and simple card using non-traditional Christmas colors of Melon Mambo and Bermuda Bay. Love this color combo paired with black. 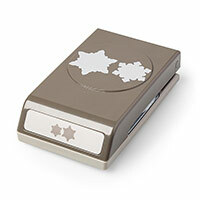 The snowflake was stamped and punched using the Flurry of Wishes stamp set and Snow Flurry punch. The black panels overlay a 3/4" strip of alternating scrap pieces of Melon Mambo and Bermuda Bay. Blushing Bridge, Pink Pirouette and Smoky Slate. For this card I used the Folded Star Technique using Smoky Slate card stock and Designer Series Paper and Pink Pirouette Designer Series Paper built on a piece of 3 3/4" x 3 3/4" white card stock base. I cut a circle out of a 4"x 4" Pink Pirouette card front using my Big Shot and Circles Framelits. I then embossed it with the Big Shot and Stylish Stripes Embossing Folder. I secured the folded star behind the cut circle using SNAIL adhesive and added a Blushing Bride ring to the front to finish it off. I added a Blushing Bride Candy Dot to the center of the star, then mounted it on a Smoky Slate card base using Dimensionals. The colors reminded me of a baby card, so I added a sweet sentiment using Teeny Tiny Wishes and cut it out using the Big Shot and Bitty Banners Framelits. Calypso Coral, Crisp Cantaloupe and Pistachio Pudding. I decided to change things up a little bit by creating a simple corner bookmark out of Pistachio Pudding card stock and adding a pretty Calypso Coral scrunchy flower. This is a quick and simple gift idea that allows you to use up some of your paper scraps! Cut Pistachio Pudding base for bookmark to measure 3” x 3”. Using the Diagonal Score Board, score at 1 ½”. Flip the base over and score other side at 1 ½”. Fold scored corners down to form a triangle. Place a piece of scotch tape over the flaps to keep them closed. Cut another piece of card stock to 2 1/16” x 2 1/16” and cut in half on the diagonal. Adhere one of these triangles over the area where the two flaps meet to create a more finished look on the back. Stamp Bordering Blooms on piece of Whisper White card stock using Crisp Cantaloupe ink. Attach piece to the front of the bookmark. -Punch 6 flowers using the 1 ¼” Scallop Circle Punch out of card stock or Designer Series Paper. -Scrunch each scallop circle into a ball and then open up. If you are using card stock, you may want to spritz the scallops with a little bit of water to help soften them up. Let dry, and then open them up. 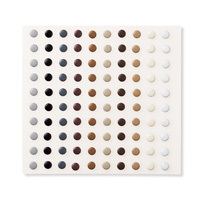 -Using the Paper Piercing Tool and Mat, pierce a hole in the center of each scallop circle. -Insert a brad through each hole, forming the flower. -Place a small strip of Sticky Strip to the underside of the flower. Peel off the red backing and apply to the front of the bookmark. -Use the fringe scissors to cut fringe on a piece of card stock or Designer Series Paper. Roll the strip and adhere the end using Tombow All Purpose Glue. Hold roll for a few seconds to let glue dry. TIP: Be sure to place the paper all the way into the fringe scissors for cutting. If you use the tips of the scissors, you will end up cutting the fringe off. -Place a small amount of Tombow All Purpose Glue to the center of the flower and attach the rolled fringe. Set aside to let the glue dry. -Open up the fringe as desired. Scrunch or open up the scallop circles as desired. I had left over circles from my punched circle lollipop project (posted on 08/06), and since I never want to throw anything away, I thought I better make something out of them. For the lollipop project, I started out punching 1" circles, and then decided they were too big. So, I punched the middles out using my 3/4" circle punch, leaving these funky circles.